Retro Gamer issue 48 is now available. And this is what you can read in the latest edition of the magazine. You can buy the latest issue on imagineshop.co.uk. Next issue (that’s number 49) is out on March 27. Two new Virtual Console games on Friday February 29. Enter a world created by the mind of a twisted demon in this side-scrolling shooter! Your soul has stumbled into the evil world that exists in evrybody’s heart. The only way out is to blast your way past the groteswue creatures that block your path in 5 causes (stages). You must face the dangers of this psychedelic world, making full use of 3 Shot types and a satellite option. With power-ups, you can change your Shot type to a wide-coverage Beam, a satellite-generated Laser and more. You can also block enemy fire by rotating the satellites to the desired position. Will you have the skill to escape this strange and surreal world? You are Bren McGuire, on a United Planets Freedom Forces mission to save the peaceful planet Katakis from the Machine, source of all that is cruel and evil in the universe. The only weapon on your side is the state-of-the-art Turrican Assalt Suit. Equipped with multiple weapons, including the incredible freeze-beam, that temporarily immobilizes almost any enemy, the Turrican Assault Suit gives one man the power of an entire army. Use the myriad of weapons and powers at your disposal to fight through 12 increasingly insane levels, free the innocent residents of the planet Katakis, and crush the oppressive Machine. 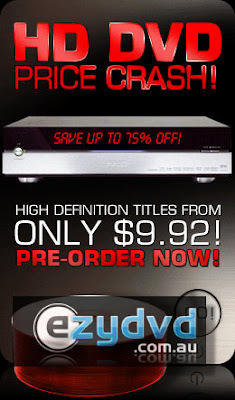 After Toshiba said that they will stop producing HD DVD players, we have seen several price reductions on HD DVD movies. There are many sales on different websites, so you have to look around to see where you can get the best hot HD DVD deal. Some of these sales are time limited, so they will go away, but new ones will probably rise. But I don’t det big firesale have started yet. I have listed some websites/deals below from Amazon.com, DVDcrave.com, DeepDiscount.com, ezydvd.com.au. Just click on the pictues. If you can’t wait until then. You can head over to Play-Asia.com and order DualShock 3 now. This is the Japanese version, but it will work on both US and European PS3s. Microsoft have dropped the price for the HD DVD add-on for Xbox 360 to only $50. This follow the news the other day (read here) that Microsoft will discontinue the HD DVD player add-on. The new price is already relfected on Amazon.com and Amazon.co.uk. Beginning today, in most regions, you can pick up the Xbox 360 HD DVD Player for an estimated price of $49.99 /€49.99 (and equivalent local currencies). I woke up today with a blue Wii with a mail from Nintendo that there was a firmware update for the Wii. This updated the firmware from v3.1 to v3.2. This is only a minor update.